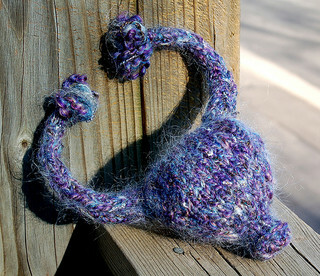 As promised to a participant in a recent craft and birth session, today I am sharing my collection of links to free knitting and crochet patterns for uteruses (or uteri – I’m never quite sure?!) and other body parts. If you have more, then please feel free to add links in the comments! I do have one of these rather plain but useful uteruses, knitted by my mum, and it works really well for showing the basic principles of cervical dilation and how babies curl up in different positions. There’s a very similar pattern here but as I find some patterns easier to follow than others, I’m posting all I have in the interest of offering maximum choice. Back to the smaller versions – some of which even have fallopian tubes and ovaries – and we have Ursula Uterus, who was possibly the best post-hysterectomy present ever, Uttie the stuffed uterus stressball or a drawstring bag uterus, which the author suggests keeping tampons in. 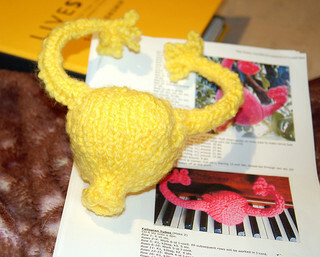 Amnesty International invited Canadian women to knit uteri from the pattern shared by knitty.com and send them to their MPs in order to highlight sexual and reproductive rights to Canadian MPs – you can see the pattern and the campaign information here – and another important step on is the caesarean awareness knitted uterus, complete with scar.